Kitchen, from design to build and completion. Nice to see you back and good to hear the job is getting done. Looking forwards to seeing the project. Will be interested to see this progress Jim. Its also good to see quite a few other people on here now all with interesting projects. Finally about to build this, lots of delays from client and builder. Will update with pics when its done. Good to hear your customer liked the design and that you have plenty of work to be getting on with. How do you make kitchens like this, do you subcontract the machining ? I’ll be happy to help any way if necessary. But I might take some time to answer as I’m very busy myself at the moment. We are moving house and workshop to a new location, and what with running our websites and keeping up the the carpentry jobs I still have hanging around my days are short. As an aside I have been given the go ahead on another job that I’m going to draw up now! As promised click here for the video on setting up the hardware fitting for Blum Grooved Profiles. Sorry I was a bit long in getting it on line as I have been busy on site these last couple of days. I took the opportunity in the video to show how to set up hard ware libraries and rules, so it’s a bit long and involved but I hope it’s clear and useful. Tell me what you honestly think as any feed back would be great to help me improve on future videos. Well done very nice job! I’ve been away on site this afternoon so I haven’t had time today to shoot the video on profiles as hardware fittings to get the right notches. I’ll try to get it up tomorrow. Almost there visually I think. Even made a dodgy looking oven! Will have to tweek it before running a cutting list though so I get the right size panels. Will add a pic a bit later! Click here for the video on how to set up the horizontal rails for presentation purposes. As I say in the video this method gives a reasonable visual of the rails but the notched uprights are not correctly marked out. I’m shooting another video that shows how to set up the notches as hardware. Like that using a manufacturing method will place the rail notches automatically each time you set up drawers and you wont have to calculate the rail positions. This is really powerful and entirely automatic. Unfortunately it doesn’t draw the actual rails. Hope to get it up tomorrow. Click here for the video on vertical handles profiles. I’m working on the horizontal profiles but they are a bit tricky so might not be done this week-end. Thanks Ness, I have got the plinth sorted now and the cabinets set up right, will start to look like it should once the handles are added I think. With the Oven its just a standard looking built in oven. Here’s the the plinth video. This is great idea, for a Polyboard project and I’d love to help you on this. It will certainly be interesting for me as I’m not too savey in kitchen design. I’ll shoot a couple of video to show how to do the plinths, handles and side panels. For the appliances can you give me the models that you want to show and I’ll set them up for you. If you can tell me how you assemble the cabinets and some general info on the design, materials hardware etc, I could set you up a few manufacturing methods that might make things easier. I’m uploading the first video now so should be online in an hour or so. Good luck with the designing. This is as far as I have got now. Need to work out how to make the plinth overpass the carcase so it looks contiuos (no gaps) without having to make a seperate item. How to add and end facing panel that hides the side of a unit. How to make an appliance like oven or hob and sink and tap. Best of luck with that Jim. I would be more than interested in seeing something like this. I have fitted a few kitchen (ikea, magnets etc) but would really like to get set up to make hand made kitchens. All in good time. Interesting post. Thanks Jim. Heres a link to the drawing I was sent to work from for the the main elevation. Not very easy to make much sense of, but the basic info is there now to try and do it as a polyboard project. I have recently been instructed by an architect I have worked with previously to build a kitchen for a clients project he is working on. 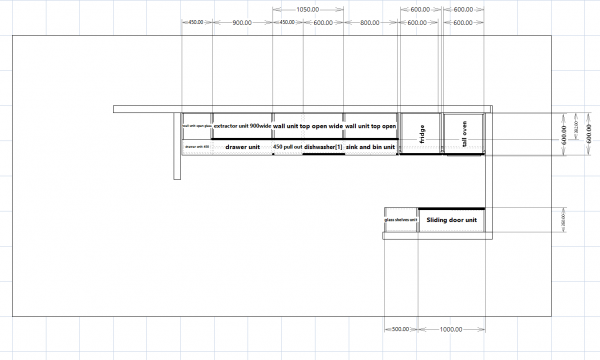 The client has done some rough sketches which they have asked me to turn into a kitchen. So I decided to try and make this my first full and propper polyboard job. By that I mean designing it with full details (no dodgy workarounds) and produce the full cutting list rather than manually checking or adding bits I was unable to design. I also need to make the drawings good enough to present to a client and architect! Next I will document the build, showing how we normally construct cabinets and any specialist fittings we use on this job (there will be a few, sliding doors is one) as well as info on a corian solid surface worktop. There are also specialist finishes involved, gloss spray finish and concreate effect doors and drawer fronts. Finally (not till sept) I will show the installation and final finished result!